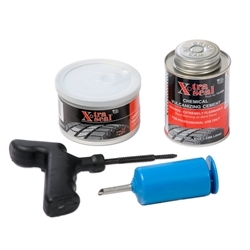 X-TRA Smooth Tire Plug Kit BOWES TR 12100. contains: 1 - TR-12101, 1 - TR-12107, 1 - TR-14008, and 1 - TR-14211. These inserts are the easiest and most effective way of “filling the injury” and are designed for use in passenger or truck, radial or biasply tires. These inserts will fully vulcanize either chemically or in a heat curing system. #TR-12107 and #TR-12107L are installed using #TR-12101 insert gun.